GABION SUPPLY is the exclusive U.S. supplier of DURA-FLEX Gabion baskets and mattresses in Galvanized or Galvanized w/ PVC coated steel wire mesh. DURA-FLEX Gabions are double twisted hexagonal woven galvanized steel wire mesh baskets with a rectangular box shape. Mounted within are diaphragms that form equal size compartments or cells. The compartments or cells are filled with natural stone and the diaphragms minimize stone migration within the basket and providing even distribution of the stone fill throughout the basket even after structural movement. Our DURA-FLEX GABION BASKETS and "RENO" MATTRESSES are pre-assembled in the factory and shipped flat to the job site. Installation consists of erecting, placement, wiring and filling with stone. Gabions can be used for various applications including: retaining walls, soil retaining structures, stream and river bank protection, slope paving, outfall structures, weirs, check dams, etc. Our DURA-FLEX aka "RENO" Mattresses are low profile / mattress shaped (rectangular) baskets constructed of double twisted hexagonal woven galvanized steel wire with internal diaphragms that create compartments or cells. The compartment or cells are of equal dimensions and spacing to provide even distribution of the stone fill throughout the mattress even after structural movement. Even distribution of the stone fill ensures that the Reno Mattress maintains intimate contact with the foundation soil. Double Twisted Mesh Gabions & Reno Mattresses are commonly used for channel linings, river training, soil retention, slope stabilization, and other applications successfully throughout the world for over 100 years. Double Twisted Mesh Gabions & Reno Mattresses offer many advantages over other types of construction materials. Some of the advantages offered by double twisted mesh gabions & reno mattresses are flexibility, durability, strength, permeability, ecology, reliability, longevity, low cost, and an aesthetic appearance. One of the most important advantages of double twisted mesh gabions & reno mattresses is their flexibility both for the individual unit and the overall gabion or reno mattress structure. The Double Twisted Hexagonal Mesh construction of the gabion units permits it to tolerate soil irregularities or differential settlement without failure. This property is especially important when a structure is on unstable soil conditions or in areas where scour from wave action or currents can undermine the toe of the structure and cause structural settlement. DURA-FLEX GABION BASKETS & RENO MATTRESSES constructed from high strength double twisted hexagonal mesh filled with natural hard durable stone and connected together to create a monolithic mass structure capable of undergoing structural movement without any loss of structural integrity creating a highly durable structure. DURA-FLEX Double Twisted Hexagonal Mesh GABION BASKETS & RENO MATTRESSES have the strength and flexibility to withstand forces generated by water and earth masses. The most important and relevant strength characteristics of design standards are the mesh punch strength, mesh tensile strength, pull apart resistance strength of the mesh, and corrosion resistance of the mesh. The strength values of the double twisted mesh are represented in ASTM A975-97. Twisted Wire Gabions are defined as double twisted woven wire mesh box shaped baskets of various sizes and dimensions. The selvedges of the gabion baskets are the thicker perimeter and edge wires to which the wire mesh is secured. Reinforcing wires are the thicker wires incorporated into the netting during fabrication. 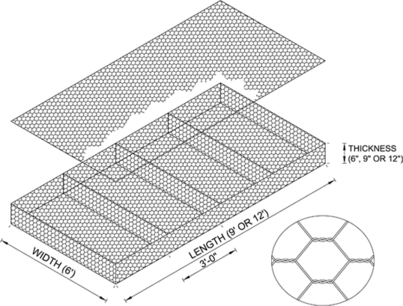 Diaphragms are internal wire mesh panels that divide the gabions into cells. Lacing or tie wire is used to assemble and join the gabion units together. Connecting wires are the internal wires used to prevent the gabion walls from bulging Hi-tensile steel Hog ring "C" fasteners are ASTM approved wire fasteners that may be used in lieu of lacing wire. DURA-FLEX Double Twisted Hexagonal Steel Wire Mesh Gabions are fabricated in such a manner that the sides, ends, lid and diaphragms can be assembled at the construction site into rectangular baskets of the sizes as required. 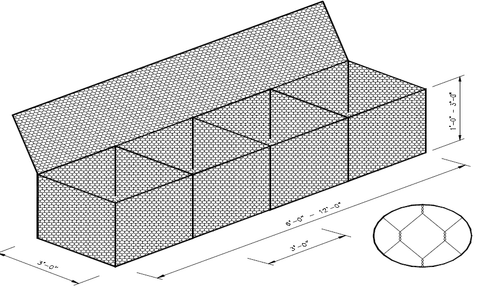 Gabions shall be of single unit construction: the base, lid, ends and sides shall be either woven into a single unit or edge of these members connected to the base section of the gabion in such a manner that strength and flexibility at the connecting point does not compromise the engineered structural design of the gabion. Where the length of the gabion exceeds one and one half its horizontal width, the gabion shall be divided by diaphragms of the same mesh and gauge as the body of the gabion, into cells whose length does not exceed the horizontal width. Each gabion comes furnished with all the necessary diaphragms secured in proper position on the base with no additional tying required at this juncture. The double twisted hexagonal wire mesh shall have de-formability sufficient to permit minimum of mesh elongation equivalent to 10% of the un-stretched length of the mesh test section without reducing the gauge or the tensile strength of the individual wire strands to values less than those for similar wire, one gauge smaller in diameter. The wire mesh is fabricated to be non-raveling. This is defined as the ability to resist pulling apart at any of the twists or connections forming the mesh when a single wire strand in a section of mesh is cut. The rock fill material used for filling the gabion baskets shall be clean, non-degradable hard quarried rock with pieces ranging from 4-8 inches. Gabion Mattresses have smaller mesh openings and should be filled with 3-6 inch rocks. Retaining Walls: Gabions used as earth retaining structures provides a low cost alternative to concrete or masonry retaining walls. The permeability of gabion structures has the benefit of reducing water pressures behind the structure and allows free drainage. Gabions can also provide a cost effective, aesthetically pleasing and environmentally friendly alternative to concrete systems. Flexible gabion structures used in the construction of retaining walls are a simple, functional solution. These structures can withstand harsh environmental and climatic conditions. Highways are infrastructures representing heavy investment. It is therefore vital to protect them from environmental disasters. Gabion mattresses are used to stabilize the slopes protecting the shoulders of highways that are prone to erosion. Highway protection work also includes rockfall protection, retaining structures, culvert and bridge protection, where mesh fabric, gabion boxes or mattresses are used depending on the situation. Protection against rockfall from slopes can be guaranteed by using various structural solutions or by merely using gabion mesh fabric as a passive measure. The gabion mesh obstructs rockfall and protects infrastructures. This is achieved by joining together rolls of mesh fabric with lacing wire and using it as a blanket to cover slopes. Alternatively, gabion retaining walls are built which stop falling rocks. Gabion baskets and mattresses are used extensively in the construction of culverts and bridge supports as a guide and protector of unconfined water flow. The main function of the gabion structures is to control and guide the course of water through channels and prevent the erosion of banks. Flexibility and permeability of these structures, permit the natural movement of ground water. Special Stainless Steel or PVC coated steel wires offer highest resistant to corrosion and other environmental effects. Beach protection, marinas, retaining walls, ramps, piers and small jetties can be built at great speed and minimum cost. Gabions also dissipate wave energy thus conserving beaches and preventing erosion.